If you feel a sense of shallowness creeping into your life and work then read this book. The author does a great job not only highlighting the benefits of a focused life but also provides practical steps on how to do deep work. I’ve been challenged to arrange my life even more around the deep work I do, which is copywriting and solving marketing problems for clients. You can grab a copy of this book on Amazon here. Jung would rise at seven a.m., Currey reports, and after a big breakfast he would spend two hours of undistracted writing time in his private office. His afternoons would often consist of meditation or long walks in the surrounding countryside. There was no electricity at the Tower, so as day gave way to night, light came from oil lamps and heat from the fireplace. Jung would retire to bed by ten p.m. “The feeling of repose and renewal that I had in this tower was intense from the start,” he said. Jung retreated to Bollingen, not to escape his professional life, but instead to advance it. In the 44-year period between 1969 and 2013, Woody Allen wrote and directed 44 films that received 23 Academy Award nominations—an absurd rate of artistic productivity. Throughout this period, Allen never owned a computer, instead completing all his writing, free from electronic distraction, on a German Olympia SM3 manual typewriter. Shallow Work: Noncognitively demanding, logistical-style tasks, often performed while distracted. These efforts tend to not create much new value in the world and are easy to replicate. To the chagrin of both my friends and the various publicists I’ve worked with on my books, I’ve never had a Facebook or Twitter account, or any other social media presence outside of a blog. I don’t Web surf and get most of my news from my home-delivered Washington Post and NPR. I’m also generally hard to reach: My author website doesn’t provide a personal e-mail address, and I didn’t own my first smartphone until 2012. In the ten-year period following my college graduation, I published four books, earned a PhD, wrote peer-reviewed academic papers at a high rate, and was hired as a tenure-track professor at Georgetown University. I maintained this voluminous production while rarely working past five or six p.m. during the workweek. I build my days around a core of carefully chosen deep work, with the shallow activities I absolutely cannot avoid batched into smaller bursts at the peripheries of my schedule. Three to four hours a day, five days a week, of uninterrupted and carefully directed concentration, it turns out, can produce a lot of valuable output. For the most part, I don’t touch a computer between the time when I get home from work and the next morning when the new workday begins (the main exception being blog posts, which I like to write after my kids go to bed). This ability to fully disconnect, as opposed to the more standard practice of sneaking in a few quick work e-mail checks, or giving in to frequent surveys of social media sites, allows me to be present with my wife and two sons in the evenings, and read a surprising number of books for a busy father of two. More generally, the lack of distraction in my life tones down that background hum of nervous mental energy that seems to increasingly pervade people’s daily lives. In this new economy, three groups will have a particular advantage: those who can work well and creatively with intelligent machines, those who are the best at what they do, and those with access to capital. 1. The ability to quickly master hard things. 2. The ability to produce at an elite level, in terms of both quality and speed. The two core abilities just described depend on your ability to perform deep work. If you haven’t mastered this foundational skill, you’ll struggle to learn hard things or produce at an elite level. “Let your mind become a lens, thanks to the converging rays of attention; let your soul be all intent on whatever it is that is established in your mind as a dominant, wholly absorbing idea.” This advice comes from Antonin-Dalmace Sertillanges, a Dominican friar and professor of moral philosophy, who during the early part of the twentieth century penned a slim but influential volume titled The Intellectual Life. The problem this research identifies with this work strategy is that when you switch from some Task A to another Task B, your attention doesn’t immediately follow—a residue of your attention remains stuck thinking about the original task. To produce at your peak level you need to work for extended periods with full concentration on a single task free from distraction. In short, I’ll live the focused life, because it’s the best kind there is.” We’d be wise to follow her lead. Ironically, jobs are actually easier to enjoy than free time, because like flow activities they have built-in goals, feedback rules, and challenges, all of which encourage one to become involved in one’s work, to concentrate and lose oneself in it. Free time, on the other hand, is unstructured, and requires much greater effort to be shaped into something that can be enjoyed. You don’t need a rarified job; you need instead a rarified approach to your work. If you visit Knuth’s website at Stanford with the intention of finding his e-mail address, you’ll instead discover the following note: I have been a happy man ever since January 1, 1990, when I no longer had an email address. I’d used email since about 1975, and it seems to me that 15 years of email is plenty for one lifetime. Email is a wonderful thing for people whose role in life is to be on top of things. But not for me; my role is to be on the bottom of things. What I do takes long hours of studying and uninterruptible concentration. Knuth deploys what I call the monastic philosophy of deep work scheduling. This philosophy attempts to maximize deep efforts by eliminating or radically minimizing shallow obligations. Practitioners of the monastic philosophy tend to have a well-defined and highly valued professional goal that they’re pursuing, and the bulk of their professional success comes from doing this one thing exceptionally well. The bimodal philosophy believes that deep work can produce extreme productivity, but only if the subject dedicates enough time to such endeavors to reach maximum cognitive intensity—the state in which real breakthroughs occur. This is why the minimum unit of time for deep work in this philosophy tends to be at least one full day. To put aside a few hours in the morning, for example, is too short to count as a deep work stretch for an adherent of this approach. To this day, my uncle remembers Isaacson’s impressive work habits: It was always amazing… he could retreat up to the bedroom for a while, when the rest of us were chilling on the patio or whatever, to work on his book… he’d go up for twenty minutes or an hour, we’d hear the typewriter pounding, then he’d come down as relaxed as the rest of us… the work never seemed to faze him, he just happily went up to work when he had the spare time. Isaacson was methodic: Any time he could find some free time, he would switch into a deep work mode and hammer away at his book. I call this approach, in which you fit deep work wherever you can into your schedule, the journalist philosophy. This name is a nod to the fact that journalists, like Walter Isaacson, are trained to shift into a writing mode on a moment’s notice, as is required by the deadline-driven nature of their profession. Ritualize An often-overlooked observation about those who use their minds to create valuable things is that they’re rarely haphazard in their work habits. Consider the Pulitzer Prize–winning biographer Robert Caro. As revealed in a 2009 magazine profile, “every inch of [Caro’s] New York office is governed by rules.” Where he places his books, how he stacks his notebooks, what he puts on his wall, even what he wears to the office: Everything is specified by a routine that has varied little over Caro’s long career. “I trained myself to be organized,” he explained. Where you’ll work and for how long. How you’ll work once you start to work. How you’ll support your work. Rowling’s decision to check into a luxurious hotel suite near Edinburgh Castle is an example of a curious but effective strategy in the world of deep work: the grand gesture. The concept is simple: By leveraging a radical change to your normal environment, coupled perhaps with a significant investment of effort or money, all dedicated toward supporting a deep work task, you increase the perceived importance of the task. This boost in importance reduces your mind’s instinct to procrastinate and delivers an injection of motivation and energy. Grove cut him off with a gruff reply: “You are such a naïve academic. I asked you how to do it, and you told me what I should do. I know what I need to do. I just don’t know how to do it.” As Christensen later explained, this division between what and how is crucial but is overlooked in the professional world. It’s often straightforward to identify a strategy needed to achieve a goal, but what trips up companies is figuring out how to execute the strategy once identified. The authors of this study, led by the Dutch psychologist Ap Dijksterhuis, set out to prove that some decisions are better left to your unconscious mind to untangle. In other words, to actively try to work through these decisions will lead to a worse outcome than loading up the relevant information and then moving on to something else while letting the subconscious layers of your mind mull things over. Observations from experiments such as this one led Dijksterhuis and his collaborators to introduce unconscious thought theory (UTT)—an attempt to understand the different roles conscious and unconscious deliberation play in decision making. It wasn’t the people who determined performance, but whether or not they got a chance to prepare by walking through the woods. This study, it turns out, is one of many that validate attention restoration theory (ART), which claims that spending time in nature can improve your ability to concentrate. Only the confidence that you’re done with work until the next day can convince your brain to downshift to the level where it can begin to recharge for the next day to follow. Put another way, trying to squeeze a little more work out of your evenings might reduce your effectiveness the next day enough that you end up getting less done than if you had instead respected a shutdown. Another key commitment for succeeding with this strategy is to support your commitment to shutting down with a strict shutdown ritual that you use at the end of the workday to maximize the probability that you succeed. In more detail, this ritual should ensure that every incomplete task, goal, or project has been reviewed and that for each you have confirmed that either (1) you have a plan you trust for its completion, or (2) it’s captured in a place where it will be revisited when the time is right. The process should be an algorithm: a series of steps you always conduct, one after another. When you’re done, have a set phrase you say that indicates completion (to end my own ritual, I say, “Shutdown complete”). I propose an alternative to the Internet Sabbath. Instead of scheduling the occasional break from distraction so you can focus, you should instead schedule the occasional break from focus to give in to distraction. The goal of productive meditation is to take a period in which you’re occupied physically but not mentally—walking, jogging, driving, showering—and focus your attention on a single well-defined professional problem. Depending on your profession, this problem might be outlining an article, writing a talk, making progress on a proof, or attempting to sharpen a business strategy. As in mindfulness meditation, you must continue to bring your attention back to the problem at hand when it wanders or stalls. “Thinking deeply” about a problem seems like a self-evident activity, but in reality it’s not. When faced with a distraction-free mental landscape, a hard problem, and time to think, the next steps can become surprisingly non-obvious. In my experience, it helps to have some structure for this deep thinking process. I suggest starting with a careful review of the relevant variables for solving the problem and then storing these values in your working memory. They wanted to understand what differentiated these elite memorizers from the population at large. “We found that one of the biggest differences between memory athletes and the rest of us is in a cognitive ability that’s not a direct measure of memory at all but of attention,” explained Roediger in a New York Times blog post (emphasis mine). The ability in question is called “attentional control,” and it measures the subjects’ ability to maintain their focus on essential information. To prepare for this high-volume memorization task, White recommends that you begin by cementing in your mind the mental image of walking through five rooms in your home. Perhaps you come in the door, walk through your front hallway, then turn into the downstairs bathroom, walk out the door and enter the guest bedroom, walk into the kitchen, and then head down the stairs into your basement. In each room, conjure a clear image of what you see. The second step in preparing to memorize a deck of cards is to associate a memorable person or thing with each of the fifty-two possible cards. To make this process easier, try to maintain some logical association between the card and the corresponding image. White provides the example of associating Donald Trump with the King of Diamonds, as diamonds signify wealth. Practice these associations until you can pull a card randomly from the deck and immediately recall the associated image. As you encounter each item, look at the next card from the shuffled deck, and imagine the corresponding memorable person or thing doing something memorable near that item. For example, if the first item and location is the mat in your front entry, and the first card is the King of Diamonds, you might picture Donald Trump wiping mud off of his expensive loafers on the entry mat in your front hallway. Notice the complexity of Pritchard’s tool decision. This complexity underscores an important reality: The notion that identifying some benefit is sufficient to invest money, time, and attention in a tool is near laughable to people in his trade. Of course a hay baler offers benefits—every tool at the farm supply store has something useful to offer. The Craftsman Approach to Tool Selection: Identify the core factors that determine success and happiness in your professional and personal life. Adopt a tool only if its positive impacts on these factors substantially outweigh its negative impacts. The first step of this strategy is to identify the main high-level goals in both your professional and your personal life. Once you’ve identified these goals, list for each the two or three most important activities that help you satisfy the goal. These activities should be specific enough to allow you to clearly picture doing them. On the other hand, they should be general enough that they’re not tied to a onetime outcome. • Research patiently and deeply. • Write carefully and with purpose. Fried earlier claimed that his employees get just as much done in four days as in five days. Now, however, he’s claiming that his employees are working fewer hours. How can both be true? The difference, it turns out, concerns the role of shallow work. As Fried expands: Very few people work even 8 hours a day. You’re lucky if you get a few good hours in between all the meetings, interruptions, web surfing, office politics, and personal business that permeate the typical workday. Fewer official working hours helps squeeze the fat out of the typical workweek. Once everyone has less time to get their stuff done, they respect that time even more. People become stingy with their time and that’s a good thing. They don’t waste it on things that just don’t matter. When you have fewer hours you usually spend them more wisely. Then there’s the issue of cognitive capacity. Deep work is exhausting because it pushes you toward the limit of your abilities. Performance psychologists have extensively studied how much such efforts can be sustained by an individual in a given day. In their seminal paper on deliberate practice, Anders Ericsson and his collaborators survey these studies. They note that for someone new to such practice (citing, in particular, a child in the early stages of developing an expert-level skill), an hour a day is a reasonable limit. For those familiar with the rigors of such activities, the limit expands to something like four hours, but rarely more. This means, for example, that instead of having a unique small box for each small task on your plate for the day—respond to boss’s e-mail, submit reimbursement form, ask Carl about report—you can batch similar things into more generic task blocks. When you’re done scheduling your day, every minute should be part of a block. You have, in effect, given every minute of your workday a job. Now as you go through your day, use this schedule to guide you. Your goal is not to stick to a given schedule at all costs; it’s instead to maintain, at all times, a thoughtful say in what you’re doing with your time going forward—even if these decisions are reworked again and again as the day unfolds. If you’re not sure how long a given activity might take, block off the expected time, then follow this with an additional block that has a split purpose. If you need more time for the preceding activity, use this additional block to keep working on it. If you finish the activity on time, however, have an alternate use already assigned for the extra block (for example, some nonurgent tasks). I don’t work after five thirty p.m. I call this commitment fixed-schedule productivity, as I fix the firm goal of not working past a certain time, then work backward to find productivity strategies that allow me to satisfy this declaration. I’ve practiced fixed-schedule productivity happily for more than half a decade now, and it’s been crucial to my efforts to build a productive professional life centered on deep work. What is the project represented by this message, and what is the most efficient (in terms of messages generated) process for bringing this project to a successful conclusion? 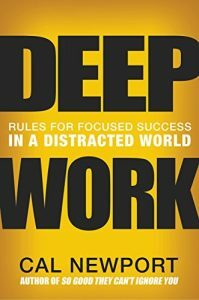 A commitment to deep work is not a moral stance and it’s not a philosophical statement—it is instead a pragmatic recognition that the ability to concentrate is a skill that gets valuable things done. To leave the distracted masses to join the focused few, I’m arguing, is a transformative experience. It’s safer to comment on our culture than to step into the Rooseveltian ring and attempt to wrestle it into something better. Did you know you can train yourself to be more grateful? If you’re skeptical that’s OK. I used to be too. But the good news is this is something you can test out on your own to see if it’s true. In a moment I’m going to suggest a simple activity you can do that only takes 5 minutes a day. Do it for 30 days and see what happens. But before we get into the mechanics of how to train ourselves to be more grateful let’s talk about why gratitude matters in the first place. Gratitude is one of the top 10 most common positive emotions, according to Barbara Fredrickson, a researcher at the University of North Carolina. The other nine are: joy, serenity, interest, hope, pride, amusement, inspiration, awe, and love. You can read more in her book Positivity. And here’s a great excerpt from Shawn Anchor’s book, The Happiness Advantage, which one of my copywriting coaches, Ed Gandia, recommended to me a couple years ago. Ed grew his part-time freelance copywriting business to $180,000 a year before going full-time. But he likes to remind his students that happiness precedes success, not the other way around. “Countless other studies have shown that consistently grateful people are more energetic, emotionally intelligent, forgiving, and less likely to be depressed, anxious, or lonely. And it’s not that people are only grateful because they are happier, either; gratitude has proven to be a significant cause of positive outcomes. I don’t know about you but those are more than enough reasons to make me want to figure out how to be a more grateful person. The great thing about “gratitude training” is that it can be simple and easy to do. There’s no reason to complicate this. Anyone can be more grateful by simply writing down three good things that happened that day. You can do this in a notebook or in an app like Win Streak (iPhone or Android). “When you write down a list of “three good things” that happened that day, your brain will be forced to scan the last 24 hours for potential positives—things that brought small or large laughs, feelings of accomplishment at work, a strengthened connection with family, a glimmer of hope for the future. In just five minutes a day, this trains the brain to become more skilled at noticing and focusing on possibilities for personal and professional growth, and seizing opportunities to act on them. So that’s it. Simply record three good things each night for 30 days and then see if it makes a difference. You may want to record a journal entry on Day #1 so you can compare it to your emotional health on Day #30. It works even better if you can share your daily wins with someone. I would share my wins with my wife and then ask her what her wins were. Make it a game. One reason I like using Win Streak is that it helps “gamify” this training. Plus, I don’t want to break my streak. Take a moment to really appreciate your three wins. I found if I don’t do this then I can engage my mind but not my heart.